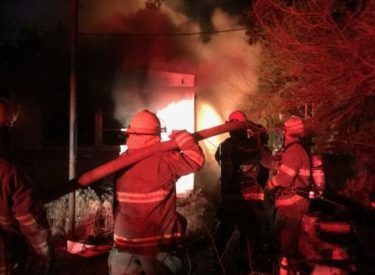 Guymon Firefighters responded to 911 call Monday night of a reported possible structure fire in the 2100 block of N. East. First arriving units found flames coming from a mobile home at 2103 N. East. “Flames were extending out the north end of the mobile home over the roof top and spreading into trees surrounding the mobile home”, said Assistant Fire Chief Grant Wadley. The fire was reported by individuals walking on East Street at 10:35pm and saw the fire coming from the home behind trees. Wadley stated, “Firefighters arrived quickly but had difficulty gaining access to this fire due to being between two other homes and large amounts of trees next to the homes. Once gaining good access, Firefighters worked to bring the fire under control within 15 minutes of arriving on scene. The mobile home was and its contents were completely destroyed by the fire with the north end completely collapsing as Firefighters fought the fire. The mobile home is owned by JoAnn Costner of Guymon. The mobile home was not being lived in at the time, but has been used as her photo studio which she was involved in for many years here in Guymon. Cause of the fire is not known at the time and being investigated by Guymon Fire officials. No injuries were reported. The Guymon Fire Department were assisted by the Guymon Police Department, Guymon Utility Authority, and Tri-County Electric.